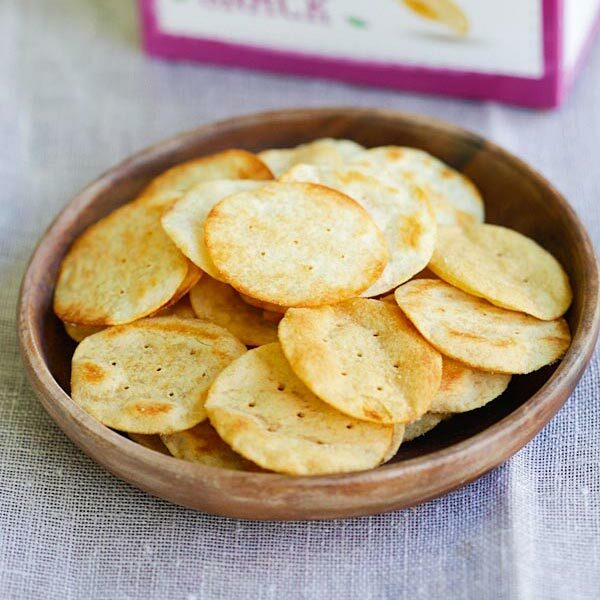 GOOD THiNS snacks are so crispy, light, non-greasy, with the perfect balance of flavors. They are also wholesome and made with the best ingredients. My family loves snacking. Little G has a huge snack container right beside his car seat, he loves snacking in the car; Mr. Rasa Malaysia munch on snacks while he is watching TV and I have a drawer full of snacks in my office. You can always find a stash of snacks in my house. I am so excited that one of my favorite brands GOOD THiNS have just launched its new GOOD THiNS Snacks and they are now available in the cracker aisle at Albertsons Cypress Village in Irvine, California. There are a variety of flavors available: GOOD THiNS Original Potato, GOOD THiNS Sweet Potato, GOOD THiNS Chickpea Garlic and Herb, GOOD THiNS Potato Spinach & Garlic, and GOOD THiNS Rice Veggie. I am partial to the Original Potato and I love Sweet Potato, so I picked up both of them a few days ago while shopping at Albertsons. What I love about GOOD THiNS Snacks is that they taste absolutely delicious and addictive. Once you try, you just can’t stop. GOOD THiNS Original Potato and GOOD THiNS Sweet Potato are so crispy, light, non-greasy, with the perfect balance o flavors. They are also wholesome, made with the best ingredients, for example: potatoes, sweet potatoes, rice, chickpeas and wheat. They are baked, not fried, so the chips are light, airy and non-greasy (no greasy fingers after snacking). There are no artificial flavors, colors, with zero cholesterol. They also have 60% less fat than the leading regular fried potato chip. Unlike other brands, the chips are not salty or loaded with MSG and I didn’t feel thirsty at all after snacking. I shared them with my good friend J and she was immediately hooked and asked me where I purchased them. They are really that good. Snacking is fun, so pick up some GOOD THiNS Snacks the next time you go shopping. They are available at the following retailers: Albertsons, Safeway, Vons, Pavilions, Jewel-Osco, Randalls, Lucky, Albertsons Market, Super Saver, Tom Thumb, Acme, Star Market, Shaws, Carrs / Safeway, Market Street, United Express, and Amigos. Hi Behroze, so sorry but I am going to change to a new video now.